Officials have identified the shooter who killed 26 people in a Texas church Sunday morning. Devin Patrick Kelley, 26, of New Braunfels, Tex., has been named as the alleged shooter. The Bureau of Alcohol, Tobacco, Firearms and Explosives is searching his home for explosives, according to ABC News. An unconfirmed LinkedIn account for Kelley lists four years of service in the Air Force and a month as a teacher aide for a Vacation Bible School in Kingsville, Tex., about two hours south of the site of the massacre. He served in logistics readiness at Holloman Air Force Base in New Mexico from 2010 until his discharge, spokeswoman Ann Stefanek says. Kelley was court-martialed in 2012 after being accused of assaulting his spouse and child and given a bad conduct discharge in 2014, the Air Force confirmed. 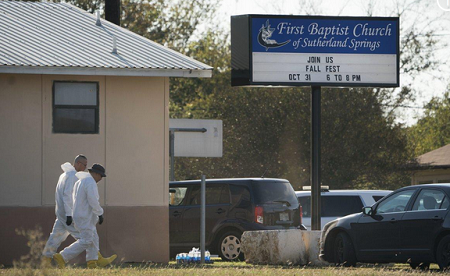 The shooting began around 11:30 a.m. at First Baptist Church in Sutherland Springs, about 40 miles southeast of San Antonio. Texas Department of Public Safety Regional Director Freeman Martin said that the suspect was dressed in all black "tactical-type gear" with a ballistic vest. He was spotted first at a Valero gas station before crossing the street to the church, where he began firing a Ruger AR assault rifle outside the building before entering and continuing to fire. Once he left the church, a local resident "grabbed his rifle and engaged" the suspect, Martin said. Kelley then fled and engaged police in a chase before he was found dead in his car.